Modernique is a lifestyle. It is a design aesthetic that has no rules or boundaries–a happy place that allows for color galore and pieces that make you smile, give pause and offer conversation. Celebrity designer Julia Buckingham leads a new generation of world-class interior designers bringing her Modernique® chic sensibility to both residential and commercial design projects around the country. 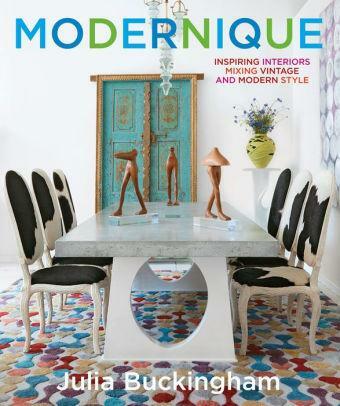 Her unique design style, captured in her new book, Modernique, Inspiring Interiors – Mixing Modern and Vintage Style, her spectacular collections of licensed product, numerous high profile panels, show houses, and personal appearances around the globe have earned her the reputation of a rock-solid force in the industry. Destined to become a design icon, Julia runs a highly successful design studio in Chicago specializing in luxury interiors with her signature vintage and modern mix. Modernique features a gem-like collection of her designed furniture alongside antiques and artifacts to cater to the high end consumer market in Phoenix. Housed inside a narrow, rectilinear 1,900 square foot space, Modernique is decorated with stylish Tabarka tilework made right here in Scottsdale, as well as white painted brick walls accented with pops of color from the curated art collection featuring top Chicago and local artists. Working with the Phoenix architect, Lance Enyart of LEA Architects, Buckingham filled this compact space with multiple vignettes mixing and matching different styles, periods, color, patterns and textures. Modernique is the exclusive retail home to Buckingham’s extensive line of furniture and accessories manufactured all over the world, that now spans nearly 300 items and is in its 4th collection.